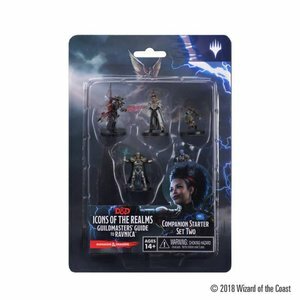 The D&D Icons of the Realms Guildmasters’ Guide to Ravnica Companion Starter Set Two contains five new heroes for your adventures, each representing one of the ten Ravnican Guilds. Players can combine this with the Guildmasters’ Guide to Ravnica Companion Starter Set One (WZK73115) to own a miniature representing each of the ten Guilds. The most influential fantasy roleplaying game brings its newest setting to tabletop play with Guildmasters’ Guide to Ravnica Companion Starter Set Two!